I’m so in love with this recipe! 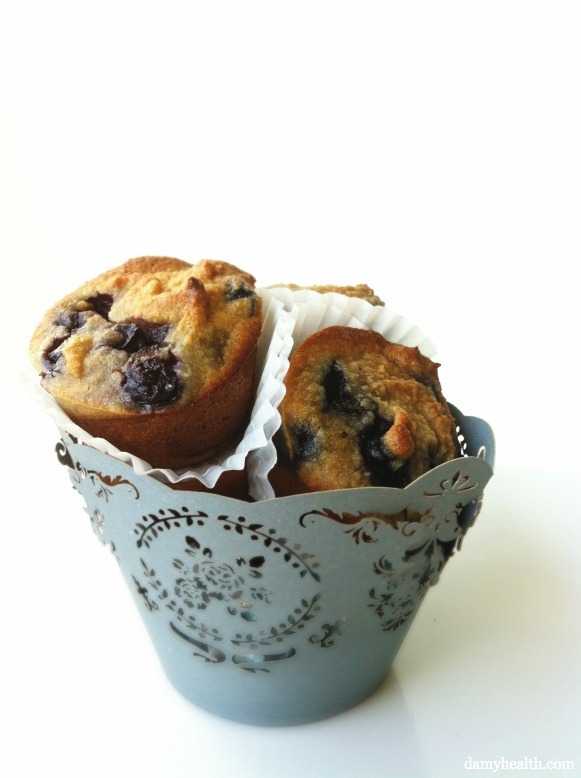 The recipe below is for my best almond flour blueberry muffins. Working with almond flour can be tricky. If you follow this recipe the way it is laid out you will be thrilled with the results. I made these in the mini muffin tins. For me personally I love having smaller portions that add up to my serving size. It really makes me feel like I’m having more and also draws more attention to my fullness level. I actually end up eating less when I use smaller portions, eat slower and enjoy the flavors of the food! I highly suggest you make this recipe. Then, come back and tell me how much you love it! I know you will! For more awesome Muffins, Protein Bars and Power Balls check out this link. This recipe is gluten free, grain free, clean, lower in carbs, moist and the best almond flour muffins I’ve ever had. DAMY Members – 2 muffins can be for meal 2 (excluding those in the last 4 weeks of the Bikini Body Program). 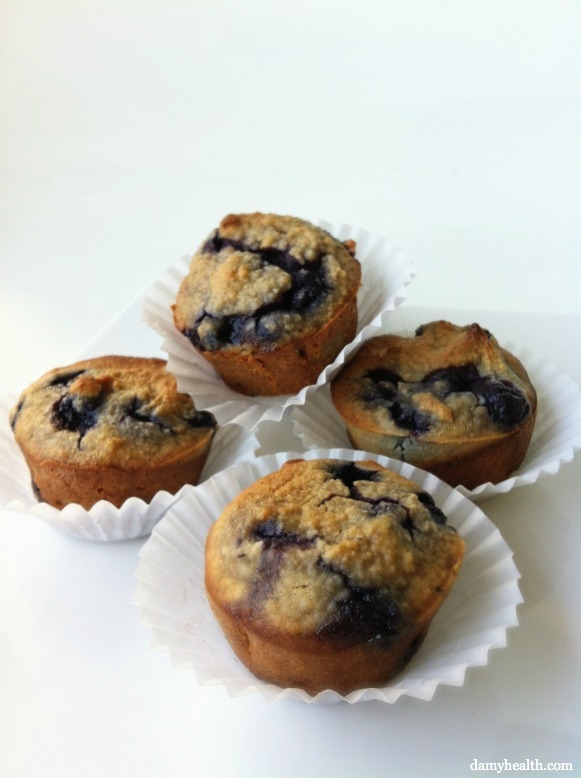 These really are the best almond flour blueberry muffins on the web! Enjoy! If you loved them let us know in the comments. These are amazing! I just made them and I am very impressed with how great they are! I will be making them now on when we want blueberry muffins! 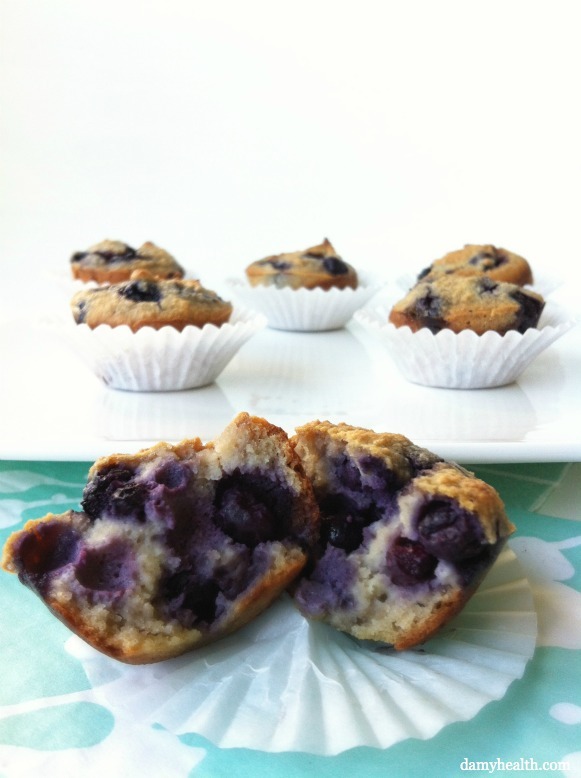 So glad these are your new staple for Blueberry Muffins! It is ours too! Everyone loves them. Is that in addiction to the other 1/2 tsp of baking soda listed in the remainder of ingredient list? Trying to make a successful snack for infant allergic to everything. I tried adding some dark chocolate pieces on top– super good. I also cheated and used butter, because it was my first time using almond meal, and I was afraid to go all the way healthy lol. Instead of apple cider vinegar I subbed a splash of white vinegar, but might skip it next time. I also used a little bit of agave, maple flavored agave and honey totaling almost a forth of a cup. I will absolutely be making these again! So glad you will be making them again Kara! Let us know when you do. We love to hear it! I just made them exactly like the recipe…Perfect! I am in heaven right now. The vinegar gives them a sourdough or buttermilk hint…yum! Aren’t these good!? Hope you’re having a great day! My boys and I needed something to do on this rainy day so we made these muffins (along with a few other recipes on this site). I used our homemade almond flour (dried and ground from the left over pulp from our Almond Milk). I think that threw the texture off a bit but I was really happy with the taste of these muffins. My boys (ages 11 and 5) wanted a little more of a sweet taste to them so I might sprinkle some raw sugar on the top for them the next time. So happy you loved them! Great idea with the homemade almond flour. Isn’t the taste so nice?! I love your website!!! Its the best!!!! Are you using blanched almond flour? I read that toxins exist in the unblanched almonds. thanks!!! 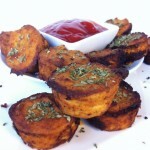 How can I make these vegan???? what is the nutration value per muffin? Lucy’s Kitchen (online) has the MOST AMAZING almond flour. These are great! Thanks so much for a great recipe! Thanks so much for a great recipe! My family loved it! These are great! And so easy! That is so great to hear Jennifer 🙂 Thank you for sharing the love! i heard that you can use lemon juice in place of apple cider vinegar and just double, instead of the vinegar ? I am vegan so could I use egg replacers? thanks! This is a very good recipe! I used raw honey and had to substitute white vinegar for apple cider vinegar but they still came out great. I’ve tried other almond flour muffin recipes but this one beats them all (not too much egg flavor and a little more airy). Next time I will use a little less honey (I used a little more than the recipe calls for). I like the natural sweetness of the blueberries and the final texture. Thanks for sharing! These are amazing! Just made them today. I followed the recipe and used honey as the sweenter. One question…if I were to use stevia instead, how much should I use? I have a liquid stevia (Nu Stevia brand) that is really good, but since it is so concentrated and I would only need a little bit, I’m afraid they might not be as moist. These muffins are amazing! I followed the recipe, except I think I added a little extra coconut oil, and they are delicious. I used honey, but was wondering about substituting stevia. I have a liquid stevia (NuNaturals brand) that I really like. Just wondering how that would throw off the recipe since it would just take a few dropperfuls to sweeten the entire batch. Would I need to add extra liquid somewhere else? Or could I use a quarter cup of xylitol to sweeten? Would I need to add more liquid then? Just discovered your site when looking for a good almond flour muffin recipe. Will definitely try your other recipes. Yum! We are paleo eaters and in looking for a replacement for bread, found this recipe. Followed the recipe exactly (used agave) and they were sweeter than I anticipated, in a good way! This will be our new go-to for blueberry muffins. Thank you! I just made these…….OMG they are fabulous! This is the first time I have ever used Almond Flour and I love it….love the taste, the smell! I used Maple Syrup for sweetener and I do have stevia, but it’s in the packet form and I didn’t know how much to use. I also cut the recipe in 1/2 because I live alone and I didn’t want to have 12 muffins sitting around tempting me. Incredible recipe, thank you very much. 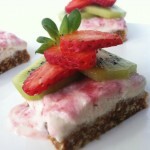 I love your site, almost everything I eat is from the recipes I have found here. You have sure changed my life! Just made them for the first time. I used blueberry honey as the sweetener and replaced the cider vinegar with apple cider vinegar with manuka honey – very delicious. Oh, that is so great to hear! Thank you for sharing!!! oh my god, these are *%#$^&! amazing. I’ve tried several almond flour muffin recipes and they all were wierd, these were not only the best gluten free muffins I’ve ever had, but the best blueberry muffins overall I’ve ever had. Thank you for sharing this. I used maple syrup and added cinnamon. lol so great to hear 🙂 Thank you for stopping by and sharing!!! These are delicious!! I sent some with my husband to work and he has already received requests for me to bake more for them! I love it!!! Thank you for sharing!! I hope you are having a great day! Can you give me a list of healthy oils? I would think flax oil, rice oil, virgin olive oil. No? Can i subsitute the eggs with some egg replacer? these are amazing. i made them twice within 24 hours, lol. amazing ingredients and delicious taste, this was exactly what I was looking for. thank you! That is so great!!! Thank you for coming by and sharing :))) Hope you are having a great day! I tried to make these and they never made it to a batter consistency? They were liked crumbled flour? These are great! Thanks for the recipe. These are amazing you will love them. No, so not per melt the coconut oil in any of my recipes unless listed. It will naturally melt just enough the the process. Enjoy! Thank you so much for your quick reply. You are right these are the best muffins I’ve ever had. I did change one thing, I am a sugar addict and have to stay away from even the Stevia, so I used unsweetened applesauce. Going to try them with other fruit next! Could I use organic Raw Honey as the sweetener instead of regular honey? Also could I go half Coconut Flour? Made these last night and had one this morning. Oh my goodness! They are wonderful! So glad I found this recipe. That is so great to hear!!! Could I make these like a cake instead of muffins?I don’t have anything to make muffins with but would love to try it. Is it possible to skip the “egg whites” part and still does not affect the outcome? Can I use baking powder instead of baking soda? Thanks. I have not tried this so I really can not tell you. It is something I will add to my list to try out. Made these this afternoon, my first gluten-free/dairy-free/sugar-free attempt, and I must say, this recipe made me look good! These muffins were delicious! My husband also approved 🙂 I followed the exact recipe, with maple syrup instead of agave (personal preference). Thanks for the great recipe. Will definitely make again! Thank you for sharing 🙂 I hope you had a wonderful weekend! Could I substitute carrots and/or zucchini for the blueberries? Did the recipe exactly but,seems not like batter very dry maybe, the blueberries will hold it together? I couldn’t tell you. I have not had this experience. Make sure you follow the recipe as is and also that all your ingredients are fresh. If I use the white powder stevia, how much to I use? It depends on the brand! I follow the suggested measure conversions on the back of the box. They always have them there. So for here for each table spoon of liquid sugar I used I would look up what the measure for 1 TBSP of stevia I would use. I find the brands differ so you have to be careful. Less is always more with stevia and their guidelines are always best. Did you use fresh blueberries or can you use thawed frozen blueberries? You can use either! Enjoy! Just not that using thawed frozen will make your muffins more “blue” in colour. But they all taste the same. I noticed that the moderator of this blog answered all the “I loved these” comments but none of the “how can I make this work for me?” comments. Kinda reflects badly as so many people have different dietary needs and are looking for ways to make an obviously great recipe fit their needs. I used coconut sugar instead but had to add a bit of water, they are amazing! These were really good!! 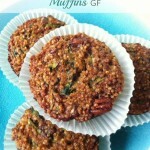 I’ve tried several gluten free type muffin recipes and this was the best by far. I have a major sweet tooth so next time I might also add a dash of pure stevia for a little added sweetness. I used honey, EVOO and because I can’t eat egg yolks I used a flax substitute (2T ground flax & 6T water boiled together for 5min) for the whole eggs. i need a food processor to make this eh? Can i use a blende or electric mixer instead? I used my kitchen aid stand mixer because I don’t have a food processor. They came out really good! made these last night, so good ! what’s the carb count ? Hi. I calculated the recipe with myfitnesspal.com, and it came out to this: for 12 muffins, using honey instead of agave. I also ground my own almonds, I find it less expensive than buying the almond meal in the stores. Hello! I made these tonight because my husband wanted blueberry muffins, but I cannot have gluten! This is a great recipe!! I grind my own almonds for almond meal, and leave it a little courser grind so it is not like a flour. The texture of the almonds pairs so very well with the sweetness of the raw orange blossom honey that I got from Florida when I was there. Then the blueberries….true heaven!! It almost tastes like a whole wheat muffin. Thank you so very much for posting this recipe! These are so delicious! Can’t wait until the hubby comes home so he can try one! I baked these and there were flavourless and small. Recipe needs sugar at least. I made these this morning and used xylitol as my sweetener. I cut the recipe in half because I didn’t want to waste any more ingredients than I had to in case they weren’t good. They were delicious! This is definitely a keeper and one I’ll share with others! Thanks! Can’t wait to look at more of your recipes! These are absolutely delicious! I also made a crumble topping with cinnamon and almond meal and it turned out so beautiful. I’ll be using this recipe for some brown nosing of my professors next week. Hey Christy! Thank you for the sharing!! I know they will love them 🙂 I hope you had a great weekend! Added fiber and flavor. I was missing the fiber, as much as I love these muffins. Tonight I substituted one cup Fiber One cereal for one cup of almond meal and the result was awesome! Great taste and texture and an additional 2 grams of fiber per muffin. Fiber One does have a small amount of Aspartame so you could use any high fiber natural cereal. That is so great to hear!!! Thank you for stopping by and spreading the love! Just made these as my first attempt to good gluten-free. Pretty good! I think I will put them in for 2 or 3 minutes less, as my muffin bottoms were a little bit too brown and will use better quality blueberries. Thanks for the recipe. I loved them. But I altered them into Banana /date muffins instead of blueberry at the urging of my child. I checked them about 4 minutes early. They were done. So great to hear 🙂 Thank you for sharing! I’ve tried a lot of different gluten free recipes over the last year and this is by far the best recipe I have made. Thanks so much! Hey Kristen! That is awesome to hear. That you so much for the love!!! Do you know if these are freezable? Usually when I try to do 1/2 a recipe things don’t work out. It would be nice to freeze them for later. anyone know the nutritional information on these? Thanks! I substituted stevia instead of the honey. Since stevia tends to be overly sweet I used 10 packets. Next time I make these muffins I will definitely use the honey, I wasn’t a fan of the stevia in this recipe. Love this recipe!! Instead of agave, and because of all the bananas I usually have around, I use a mashed banana and a couple splashes of almond milk as a substitute. Thank you! Quick easy healthy muffins ever. Had one sub, I used 1/4 cup of xylitol. Thank you so much for posting. We love them! I tried these yesterday and I was so pleased to find a base recipe to make muffins with, they were truly delicious, although I used a sugar maple syrup instead of the honey, they were moist and the girls in my office loved them! Am going to try them with bananas next! I really loved these muffins! they had a corn bread texture, which is really great. I made them into 12 normal size muffins instead, and ate 3 right away since they were so good! These truly are amazing. I love them with blueberries but made them today with apples (added 2 tbsp. of flax meal as well as 1 tsp. cinnamon) for an even lower glycemic snack. Thank you! My muffins are terrible 🙁 I had to make 2 modifications: I followed the vegan recipe and since I only had 1 cup of almond flour on hand, I subbed in 1 cup of whole wheat flour. My muffins are completely flavorless and terrible texture. Big disappointment! Awesome and you were right-one of the best recipes I have ever had, and I bake a lot!!! Thank you so much!!! Love them!!!! If making them vegan do you add 1/4 applesauce and 1tsp baking soda for each whole egg? And do you replace the egg white with something? Nope, just those ingredients listed it all you need to do. How many calories are there per muffin? So thrilled! Thank you for sharing! It does sound like it! Candy, it sounds like something is off. I have been making this recipe for years and have never had this problem. Are you able to put coconut in these and if so what amount would you recommend? Yes you can try it! I would start with 1/4 cup. Just to check again bout making it vegan – ie no egg at all – must I leave out eggs and egg whites and just use 1/4 apple sauce and bicarb only – so this is Not per egg? These were delicious. I’m sugar free so I replaced the agave w/ equal parts vanilla almond milk and they were so so good. Only issue I came across was that they didn’t rise and I ended up with muffin tops! Not complaining, though! Thanks for sharing this wonderful recipe. 🙂 Will be sharing with everyone! Just made these for the first time! My batch made 10 small muffins and I topped them with blueberries and almond slices. I really like the flavor! I also added half a tablespoon of unsweetened cocoa powder for something extra. Some things I’ll try next time: I may add more chocolate to get a fuller flavor. They came out a bit dry after 22 minutes, so I may thin out the batter a little bit more. Overall, the flavor is great! Thanks for the recipe! So great to hear! Thank you for stopping by! I just pulled these little blueberry pillows from the oven. They are great! I did add 1/4c of coconut and a 1/4 tsp of baking powder, the powder made them rise a little…….Thanks for the great recipe. thank you so much for this recipe! 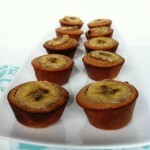 i was a bit cynical about a flourless muffin, but wow…these are amazing! my husband and my 3 year old are devouring them! thanks again! Yum! Great recipe. I don’t know if it is different because I used almond meal not flour, but the muffins came out delicious. I added the baking powder that someone suggested. Will always make this recipe! Great to hear! We adore this recipe and love to make it often 🙂 Thank you for the love! I’m so confused. I made these vegan (with the applesauce and baking soda instead of egg) and instead of agave I used honey. Those were the only changes I made and my muffins sank in the middle and are a complete mess (can’t even remove them without them falling to soggy or crumbly pieces). This is the first time this has ever happened to me in my years of muffin baking. Where did I go wrong!? Hey Tina! So weird! I make them all the time via the vegan version and have no issues. What brand of Almond flour did you use? I made these the other day and had the same thing happen. The muffin pan looked like something exploded on it. Lol I didn’t want to throw them out since Almond Flour is expensive so I still ate them and they were delicious. They just looked ugly. I wasn’t sure if I put to many blueberries or where I went wrong either. I used Bob’s Red Mill almond flour. What kind do you use? Just made these, and my kids already ate the whole batch…they were really good! I did have a lot of trouble getting them out of the pan in one piece, though, because the blueberries sank to the bottom of the batter and exploded while baking and made the bottoms very wet. One question…when making the vegan version, is the amount of baking soda 1 tsp PLUS the other 1/2 tsp called for in the recipe, or is it only 1 tsp total? Hey Sheryl! This is all so weird! I have never had this issue. So this week I am going to make them again (in this humidity) and try to figure out what is going wrong! I will post here when I do! I toss the blueberries in a little almond flour before putting them in the batter. They don’t sink if you do that. I made this recipe yesterday and between my husband and daughter, they are gone! I ended up making another batch and hiding them for my snacks:) I did the egg recipe while using honey instead of agave(I heard agave is actually not that good for you, but I may be wrong?). This will be my snack staple! Agave syrup is processed in a way, even though raw, that makes it as toxic, or even more toxic, than high fructose corn syrup. I have made these twice so far, using bob’s red mill almond flour. I did a dozen full sized muffins and used silicone cups. They turned out great both times and even my picky littles ones want them for breakfast or snack. My batter was thick enough that the berries did not sink. I added the berries after the batter was already in the cups, since adding them to the blender bowl proved hard to work with. Def will try adding coconut next time, and maybe some flax seed or slivered almonds too. Yummy! Does it make a difference if I use a hand mixer and not a food processor? Wondering the same thing? Can someone reply? Thanks!! Oh, I used 3 whole eggs too. I’ve only baked a few dessert recipes with almond flour. I’ve only recently started trying to cut out all grains.I followed the recipe exactly. However, the “maple syrup” I had in my cabinet was Aunt Jemima’s Low Calorie syrup. These just weren’t sweet enough for me. I had to add some jam to be able to get 1 down. However, the texture and aesthetics were amazing, I was impressed with HOW GOOD THEY LOOKED. Before cooking, TASTE THE BATTER, and sweeten to taste, I may add Splenda or 1/2 cup sugar (30 additional calories per muffin) on the next batch. The other people in my house who do eat more processed food/typical American, etc — did not like these at all. 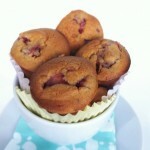 This is a great base recipe, these are grain-free muffins, next time I’ll just sweeten slightly more. I make these all the time and my kids love them. In place of blueberries, we often do chopped-up dark chocolate. I find that maple syrup results in a better texture than honey. Since there’s no time to bake before school, we often make a double batch on the weekend, then freeze the muffins (hence the chocolate instead of blueberries). Just a minute in the toaster oven, slather them with high-quality butter from our CSA, and healthy breakfast is ready in two minutes flat! Maybe I missed it but I did not see the nutritional content. I am diabetic and need to be aware of what I’m consuming. Is it really 1 Tablespoon apple cider vinegar? Or was that a typo? I’m concerned it will be sour. Nope 🙂 That is the right amount. Enjoy! How would it be with almond extract? What do you think about adding protein powder to these? I read the “count free” lifestyle, but for diabetics, they need to know carb counts so they know how much insulin to take. Would you know the carb count for the muffin or mini-muffin or know how to calculate that? I made these muffins last night and they were very good! They made 24 mini-muffins. I subbed out agave for pure maple syrup and used Kerrygold grass-fed salted butter instead of salt+ coconut oil. My muffins came out very moist and sweet. I think this recipe ONLY works though in mini-muffin tins because there is no starch to make this recipe leaven. Although I haven’t tried making full-size muffins because I enjoy the small ones better. I found elsewhere online that each mini-muffin is about 100 calories. I was intending to make this recipe without adjustments but discovered that I didn’t have any blueberries. I substituted the blueberries for chopped frozen cherries and added 1/4 cup of raw cacao and 1/4 cup of choc chips. We used pure maple syrup and these were moist and delicious. My children and I devoured them. We made regular sized in slilicon muffin trays. Thanks for a great recipe! That is awesome!! I love to hear that! SO delicious! Full size works fine for a full dozen! Thank you!! How long do you cook the mini muffins for vs. the regular size muffins? Can’t wait to try these! Thank you. I don’t have any apple cidar vinegar … can I use white vinegar or raspberry balsamic? Just made these – substituted the apple cider vinegar for freshly squeezed lime juice and they turned out great, thanks! Hi! This recipe was recommended for a friend and I’d like to try them for my daughter’s 2nd birthday party this weekend– however one of the children attending has a nut allergy. Can I substitute almond for coconut flour? Would measurements remain the same..? Thank you! I made these but modified them to make double chocolate muffins – I added about 1/4c cocoa powder and 1 cup of stevia chocolate chips. Turned out really well! Wondering if I could add some applesauce or baby food of some sort to make them a bit more moist. I can no longer have almonds so can’t use almond flour. I need to start baking with garbanzo flour and tapioca flour. Does anyone know how these compare to almond flour? I hear garbanzo is definitely not an even swap. These muffins are delicious!!! Just the right amount of sweetness, so moist and flavorful! And so easy to make! I did substitute 1/4 cup of yogurt for the 2 extra egg whites and the vinegar because whenever a recipes calls for extra egg whites or yolks, I always forget to use the remaining egg yolks or whites. I left out the vinegar because the yogurt gave the acidity that baking soda needs to fluff the muffin. It worked wonderfully! Thank you so much for sharing the recipe! Love these, i just made them and absolutely love them…. These were absolutely delicious. Thank you so much! Delicious. I’m following a low carb plan and these fit the bill. I kind of liked these, and made them earlier in the month. I used another brand of almond flour and I got that grainy taste again. They were moist but also grainy or sawdusty without the dryness. So I bought one of the recommended almond flours, but, virtually at the last minute, I threw in a box of sugar free instant vanilla pudding and OH MY GOD! Superb, superb. What kind of almond flour do you suggest? Welbee’s Superfine Blanched Almond flour. Splendid! I LOVE this idea. Who would have thought! I’m going to try it tomorrow. What kind of almond flour do you use? I used black berries because i didn’t have blue berries and added a scoop of vanilla protein powder to it. It was awesome! I did also lol i read INCLUDING instead of excluding how did it turn out with u ? These are yum! How do I store them…counter or fridge? These are awesome! 👏👏The best ones I have ever had! I made them vegan. The batter was so delicious not all of it made it to the pan😨Thanks for the share!! These are great, I made regular size ones, my family gobbled them up. Made these the vegan version. Delicious. Came out very moist though. Must cool completely before removing from pan otherwise they will fall apart a bit. Other than that I loved them and will make again! Do you use 2 eggs and 2 egg whites? I used 4 whole eggs and I halved the apple cider vinegar( makes me gag) They came out delish! I made this and followed the recipe to the T. They did not rise, they just sat in the pan like crumbled up lumps. I know I didn’t do anything wrong, so I don’t know why the first batch didn’t turn out. Second batch, I added a half teaspoon of baking powder, and a fourth of a cup of unsweetened vanilla almond milk, and they were perfect. Not sure why I had problems, but glad I had the fix to make what I had left into something edible. Thanks for the recipe! I love learning, and to become a good cook, you are always learning!